The play "Wada Gassen Onna Maizuru" was originally written for the puppet theater (Bunraku) and staged for the first time in the 3rd lunar month of 1736 in Ôsaka. It was quickly adapted for Kabuki the same year in Kyôto, in Summer or Fall 1736. This first (partial) Kabuki adaptation was entitled "Hangaku Mon Yaburi" ("The Destruction of the Gate by Hangaku" in English) and was produced by Nakamura Tomijûrô I at Miyako Mandayû's theater, starring Sanogawa Mangiku (Hangaku) and Sanogawa Ichimatsu I (Ichiwakamaru). "Wada Gassen Onna Maizuru" was fully adapted for Kabuki the following year in Summer 1737, in Ôsaka at the Ônishi no Shibai, where it was produced by Yoshizawa Ayame II (casting unknown). "Wada Gassen", the first part of the title of "Wada Gassen Onna Maizuru", is a direct allusion to the famous Wada Battle, which ended with the complete destruction of the Wada clan. "Onna Maizuru"("A Female Maizuru" in English), the second part of the title of "Wada Gassen Onna Maizuru", is an allusion to a (legendary?) historical event: the breaking down of a gate (mon yaburi) during the war between the Wada and the Hôjô clans by the warrior Kobayashi no Asahina, son of Wada no Yoshimori. In the Kabuki world, Asahina was an important character in many sogamono, which was popularized by the Edo star Nakamura Denkurô I. Asahina's mon is a beautifully-stylized dancing crane, maizuru in Japanese. So "Onna Maizuru" was easily understood by the Kabuki audience as the Female Asahina. Moreover, Maizuru was in some sogamono the name of the sister of Asahina. "Wada Gassen Onna Maizuru" was originally made up of 5 acts. Most of the scenes are no more in the Kabuki repertoire. The most famous scene, "Hangaku Mon Yaburi" ("The Destruction of the Gate by Hangaku") is still rarely-staged. Often with the following scene "Ichiwakamaru Uijin" ("Ichiwakamaru's First Battle"), which is also called "Ichiwakamaru Seppuku" ("Ichiwakamaru's Self-Disembowelment"). 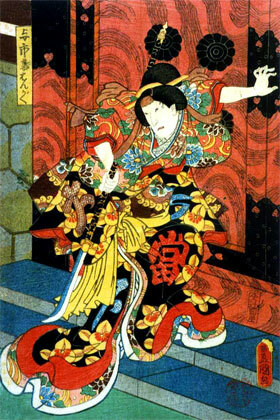 "Hangaku Mon Yaburi" is one of the best examples of onna budô in Kabuki. Fujisawa Nyûdô, a leading retainer of the Shôgun Minamoto no Sanetomo, is secretly plotting to take over the Shogunate. Taking advantage of the fact that his two rivals in the government, the shikken Hôjô Yoshitoki and the gokenin Wada Tsunemori, are both planning to marry their sons to Itsuki-no-Miya, the Shôgun's niece, he is keeping her in his palace. His plan is to succeed in making the Hôjô and Wada clans fight over the marriage problem to the bitter end and destroy themselves. The curtain opens on the house of Fujisawa where two koshimoto are talking about Itsuki-no-Miya's marriage problem. She enters and cautions them against gossiping. Egara Heita, a faithful retainer of the Shôgun, arrives at the palace and, pretending that he is a messenger from the ama midai Hôjô Masako, the wife of the first Kamakura Shôgun Minamoto no Yoritomo and the mother of the 3rd Shôgun Minamoto no Sanetomo, asks Itsuki-no-Miya whom she would like to marry. When she says that she does not like to marry either a Hôjô or a Wada, he woos her. Itsuki-no-Miya rejects his advances and retires to an inner room. Heita pursues her into the room. His plan is to disguise her as a koshimoto and secret her away, making everybody think he has murdered her! The plan is a success and Fujisawa Shirô, the son of Fujisawa Nyûdô, appears on the turret at the gate and announces that Egara Heita has killed Itsuki-no-Miya and left the house with her severed head. Informed of the incident, Prosecutor Asari Yoichi hurriedly comes to the gate of the mansion, followed by his wife Hangaku who arrives in a palanquin. Shirô does not allow Yoichi to enter his mansion because Yoichi's wife is Heita's cousin. Yoichi divorces his wife then and there, paying no attention to her complaint that their separation will make Ichiwakamaru, their 11-year old son, unhappy. Shirô, however, still does not allow Yoichi to enter his mansion. Yoichi gets angry and declares that he will break the gate. Shirô then warns him that he will be arrested if he has recourse to violence. Seeing Yoichi's hesitation, Hangaku comes forward and, declaring that she is free to do anything now that she, a divorcee, has neither family nor master, breaks open the gate (mon yaburi). At this moment a messenger comes out of the mansion to tell Yoichi that Sukekuni, Heita's father and Hangaku's uncle, is calling him for consultation. So Yoichi enters the mansion with the messenger. 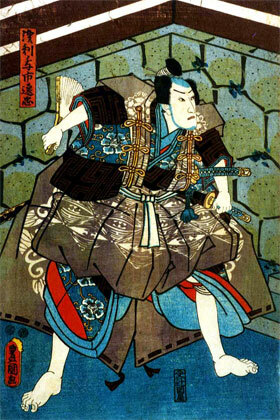 Shirô, who fell from the turret when the gate was broken, comes out limping and orders his men to attack Hangaku. Hangaku, with her tightly-gripped naginata, fights them off, displaying her marvelous strength. As a result of the murder of Itsuki-no-Miya by Egara Heita, Ebara's wife Tsunade and their son Kinsato are under the protection of Hôjô Masako, the Shôgun's mother, in her mansion. Hangaku is also staying in the mansion, having been asked by Hôjô Masako to protect Kinsato. A group of young sons of Shôgun's retainers is planning to attack Kinsato. The emissary of this group, Ichiwakamaru, Hangaku's son, who is also a member of this group, comes to the house alone in full armor, holding a bow and some arrows. He is eager to cut off Kinsato's head. When received by Hangaku he tells her that his father, Asari Yoichi, has advised him to ask his mother to tie the string attached to his helmet. When Hangaku does so, the string breaks. This is a terribly bad omen for a warrior going to the battlefield! Ichiwakamaru asks his mother whether it means it will be killed. Hangaku denies it but she suspects that her husband, by deliberately causing the string to be broken, has sent a hidden message which tells that he is going to sacrifice the boy's life in order to save Kinsato. Hangaku makes the boy wait in an inner room. Meanwhile Yoichi comes to the front of the mansion to observe what happens inside. When Hôjô Masako, Tsunade and Kinsato come to see Hangaku, she asks Hôjô Masako to allow Ichiwakamaru to kill Kinsato. The Shôgun's mother answers that Kinsato is in reality the son of the late Shôgun Minamoto no Yoriie. This secret son has been brought officially up as the son of Heita and Tsunade. As Minamoto no Sanetomo has no heir, Kinsato must succeed him as Shôgun in case Sanetomo dies. Hôjô Masako reveals that Yoichi has known this fact although he apparently has not told anything to his wife. Hôjô Masako is in tears and she appeals to Hangaku to help saving Kinsato's life. Hôjô Masako, Tsunade and Kinsato leave the stage. Ichiwakamaru comes to see his mother, who asks him what he would do if he were in fact not Ichiwakamaru but Kinsato and were pursued by men trying to kill him. Ichiwakamaru says he would courageously commit seppuku instead of living with the stigma of being the son of a murderer. Hangaku then tells him that she will enable him to have an unparalleled honor if he stays patiently in the next room and never comes out. When he leaves, Hangaku puts the light out and makes such a sound as to give an illusion of someone entering the house. Pretending to be talking with the imagined visitor, Hangaku makes Ichiwakamaru believe that the visitor is Egara Heita and that he has come to recover Ichiwakamaru who is actually his son Kinsato although he has been raised by Yoichi and Hangaku as their son. Deceived by her fictitious conversation, Ichiwakamaru believes that he is indeed Kinsato and, as he has told his mother, courageously commits seppuku. Hangaku rushes to his side, followed by Hôjô Masako, Tsunade and Kinsato. Outside the mansion Yoichi writhes in agony although what has happened is exactly what he has planned. Hangaku tells the dying Ichiwakamaru that he is really her son and that his father has planned to make him die as a substitute for Kinsato (migawarimono). Ichiwakamaru thanks his parents for making him die an honorable death. Tsunade, * holding herself responsible for Ichiwakamaru's sacrifice, which was caused by her husband's crime, tries to kill herself with a dagger but Hôjô Masako holds her hand and asks her to search for her husband. Then, she cuts Kinsato's hair to make him enter the Buddhist priesthood and pray for the repose of Ichiwakamaru's soul. Hangaku cuts off Ichiwakamaru's head in tears and says in a loud voice that she is ready to hand over "Kinsato's head" to a man who would like to receive it. As Hangaku opens the gate Yoichi approaches her and, falsely introducing himself as Ichiwakamaru, respectfully takes over the head from Hangaku.